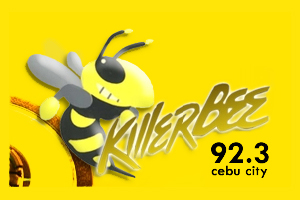 DYBN 92.3 MHz (Cebu City, Philippines) is an FM radio station owned by Quest Broadcasting Incorporated under the brand Killer Bee 92.3. The studio is located at BSP Camp, Capitol Hills, Lahug, Cebu City. Killer Bee airs from 6AM until 1AM the next day from Mondays to Thursday, from 6AM until 2AM the next day on Saturdays and Fridays, and from 6AM until 12MN on Sundays.